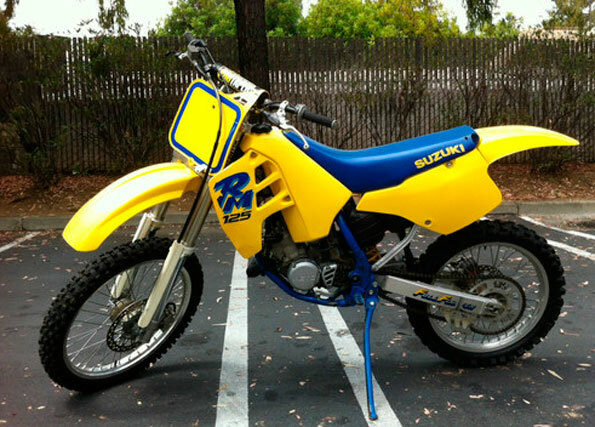 I am selling a super clean and (now) rare 1990 model Suzuki RM 125 Motocross bike. This things is in really, really nice shape for its age. This bike is in ALL OEM STOCK except for the bars, grips and levers, which are aftermarket and in great shape. Bars are Pro Taper (not the thick ones) levers as ASV and grips are Pro Taper. The rest of the machine is 100% stock with low hours. This machine is super nice. The bike is very low hours and still has the OEM kickstand. It was trail ridden at a private ranch its whole life from new. Everything else on the bike is stock, right down to the tires, chain and sprockets, which are all in great shape. The plastic is in great shape as well. That is how I bought it. Please note: The top end needs to be replaced, and the cylinder needs to be replated. It is a roughly $400 job using LA Sleeve or one of the other companies that specializes in that work. The head is fine on the bike. It is really not that bad and not a big deal. But it does need to be done. There is a rip about the size of a quarter in the seat cover in the back corner. It does not stick out, but it is there. The previous owner never once did the top end. He rode it until the bike lost compression and would not start. And thats when I bought it. That happened (the top end) this spring. I removed the top end and was going to do it myself, but basically dont have the time or energy to do so at this point, and as I am trying to slim down my collection of bikes. I just put it back together and wanted to let someone do the work, and in case they wanted to punch it out or do other motor work to it. Finding a 1990’s era 125 motocross bike in this condition is very hard to find, and this machine comes complete with the kickstand. It is missing the right side shroud sticker, but I know where you can source one for $12, or so. Adding this sticker will make bike look near new. Most of these bikes were beat to heck and ridden hard. This is a rare exception. With some really minor TLC and about $500 or less, this bike could be a full 9 out of 10 and makes a really, really solid and easy platform for a ten point resto. I do have a nice clean Cali title for the bike. BIke is advertised locally for $1100, so hit me up if you are interested and we can work something out nice and easy.